Off-the-Beaten-Path Itineraries: Alaskan Dream builds journeys around such little-visited Southeast Alaskan outposts as the native village of Kake and normally off-limits Hobart Bay, as well as iconic attractions as Glacier Bay National Park. Local Alaskan Flavor: Alaskan Dream is owned by a family in Sitka, Alaska, and its staff is mostly made up of resident Alaskans who are proud to show off their home state. 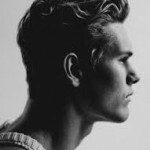 Complimentary Excursions: At least one or two complimentary excursions are offered in each port of call. 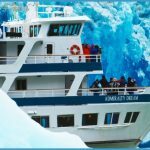 Tough Embarkation & Debarkations: Most of Alaskan Dream Cruises’ itineraries begin and end in either Ketchikan or Sitka, which can be challenging to reach. A handful of voyages begin and end in Juneau. 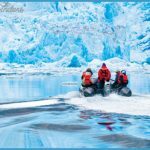 Founded in 2011 by Dave Allan, a Southeast Alaskan resident, Alaskan Dream promises a glimpse of the true Alaska away from the tourist hordes, with local Alaskans as your guides. It’s an admirable counterpoint to the massive ships that ply Alaska’s waters, yet typically only call on the big three ports of Juneau, Skagway and Ketchikan. 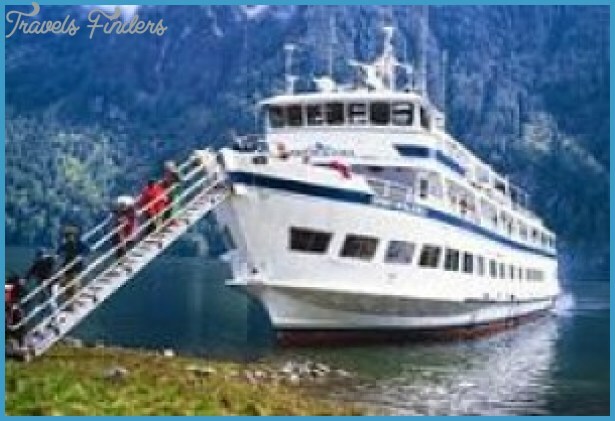 The line has five small ships, ranging in size from the 74-guest Chichagof Dream to the 40-guest Alaskan Dream (the latter is a pretty cool-looking, four-deck-high catamaran). While the line is relatively new, the Allans are no strangers to the boat-and-ship business, having owned and run Sitka-based boat building company Allen Marine since 1967, as well as Allen Marine Tours (day cruises out of several towns). The family also owns Southeast Alaska’s Windham Bay Lodge, a wilderness resort. Alaskan Dream focuses on small-ship cruises in Southeast Alaska with a local twist. The line has taken great pains to hire local Alaskans to staff its vessels, who bring an insider’s knowledge of the region. Other Alaskan touches include state products prominently featured on board vessels, from meals crafted from fresh Alaskan seafood and other local ingredients (and sided by Alaska-made beer and spirits) to the Alaska-made soaps and shampoos in every cabin. 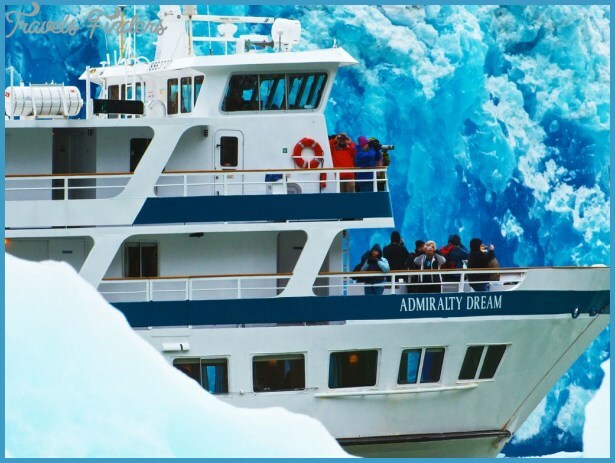 As is typical with most of the small-ship lines in Alaska, Alaskan Dream includes excursions in the base cost of its sailings, including adventure tours in Hobart Bay, along with transfers at the start and end of your voyage to either a hotel or airport. The cruising atmosphere on the line’s ships is casual, also common for small ships in AK. This line serves only Alaska, and they serve it well. Itineraries run from four to 13-days and include stops at several little-visited, locals only destinations in the region like Thorne Bay, Kasaan, and Metlakatla. In addition, many itineraries include a stop at scenic Hobart Bay, an unfrequented gem of a wilderness area that is within native lands and is normally off-limits to tourists. Alaskan Dream operates a private adventure camp within the Bay that has kayaks, motorized Zego boats, and ATVs for passenger use. 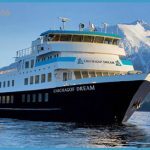 Alaskan Dream Cruises passengers tend to be well-traveled, well-educated people (most hold a bachelor’s degree or higher) in search of an authentic Alaska experience. Often they’re semi-retired or retired, and they come from all over the world, most commonly the USA, Australia, Canada, the United Kingdom, and Germany. The line also is drawing a growing number of multigenerational families, thanks to their Become A True Alaskan multigenerational voyages. These sailings carry a youth leader and include specially designed experiences suitable for children aged 7 years and up. All of the line’s ships have a single communal dining room where meals are served three times a day. As is often the case on vessels with fewer than 100 passengers, there is no fixed seating. In the morning, in addition to a full breakfast, an early morning Continental breakfast is put out for early risers, and you’ll always find snacks available at other times, whether it be a batch of muffins or afternoon cookies. All food is sourced locally when possible, including locally caught salmon and other seafood. In addition, beer from the Alaskan Brewing Company and Alaskan Distillery spirits are prominent. Passengers with dietary restrictions and allergies will find that the line makes a great effort to be accommodating. Don’t be shy about asking! Whether it be a kayak trip across a remote bay or a walk around a native village, most of the passenger activities take place off the ship and they’re all included in the base price of the trip. 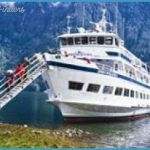 Led by naturalist guides who travel with passengers on the vessel, daily outings on a typical cruise in Alaska will include a mix of outdoorsy pursuits such as riding an ATV through a forest and visits to some of Southeast Alaska’s small fishing towns. During some port calls, there’s time for two excursions, though one is typical. Other usual outings: king salmon and king crab dinner at a lodge near Juneau; a small Zego sports-boat excursions at Hobart Bay; and visits to historically and culturally significant sights in the Alaskan towns of Sitka and Petersburg. 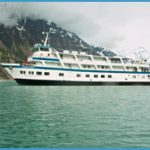 While most Alaskan Dream sailings have no formal children’s program, the line features dedicated family cruises that include daily excursions aimed at kids, young adults, and families. Activities range from classes in traditional arts to geo-caching expeditions in the rain forest. When not leading a family-friendly expedition off the ship, youth leaders coordinate onboard activities. There are no shows in the traditional sense, but in the evenings, after dinner, the ships’ lounges often are the site of onboard presentations and discussions led by scientific and cultural expedition leaders. Alaskan Dream prides itself on hiring local Alaskans to work on its ships. Naturalists and other crewmembers facilitate all off-ship and onboard activities, as well as serve meals and perform housekeeping duties. While gratuities are not mandatory, the line suggests that passengers leave $15 per person per day to be shared among the crew. 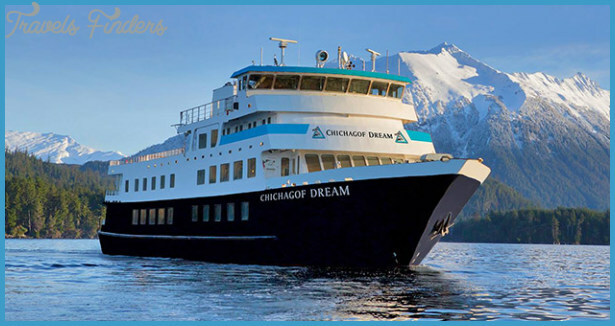 Alaskan Dream Cruises passengers can pair a cruise with a stay at Alaska’s Windham Bay Lodge, owned by parent company Allen Marine. Located about 65 miles from Juneau at the end of a 6-mile bay, the lodge lies within the Chuck River Wilderness and Tongass National Forest and accommodates up to 16 people in three guest cabins and two bedrooms in the main lodge. 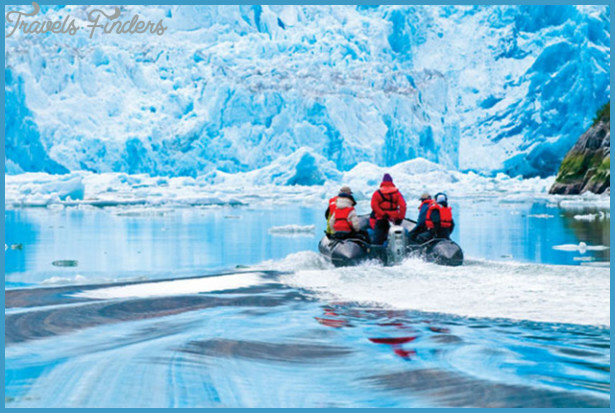 Activities include glacier viewing, wildlife watching on Admiralty Island, kayaking along Endicott Arm, exploring Windham Bay by skiff, and a visit to the company’s adventure camp at Hobart Bay. While the line is fairly new, its ships aren’t. Alaskan Dream Cruises launched in 2011 with two vessels that had sailed before in Alaska, but had been out of commission for several years. The line has since expanded its fleet to include four small-ships that hold no more than 74 guests, with much of the fleet holding roughly half that amount. Extensively refurbished, these are comfortable, well-run ships. Just don’t expect too many bells and whistles. 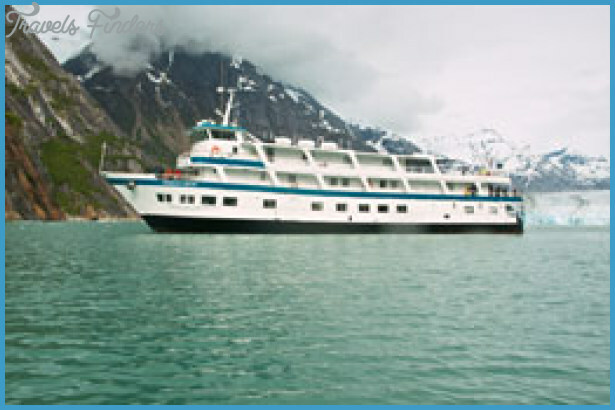 The Dream and Baranof are similarly designed ships, rugged explorers that hold between 49 and 59 guests apiece. Chichagof is the biggest and oldest in the fleet, holding up to 74 and built in 1984. All three are surprising comfortable, and features a disproportionately large amount of open deck space for ships their size, great news for nature and wildlife lovers. You might remember the Admiralty and Baranof from their days with Cruise West as the Spirit of Alaska and Spirit of Columbia. Alaskan Dream Cruises has taken good care of them and their blunt appearance has a tendency to grow on you after a while. The Chichagof has a very different history: Built in 1984, she was given a complete overhaul at the company-owned shipyard before entering service in 2016 after nearly a decade spent out of service. With their shallow drafts, all can go into narrow channels and fjords that remain inaccessible to all but the littlest boats. Cabins Cabins aboard these ships can be itty bitty (even the Owner’s Suite aboard the Admiralty Dream only measures a snug 135 square feet), but they are quite pleasant. Heavily refitted, they have new wall paneling (cherrywood accents) and lighting, plus better beds. Note: In some cabins, beds can’t be pushed into a queen configuration, and are set in a fixed twin setup. Public areas & activities Guests aboard both ships will find a forward-facing lounge on Main Deck that serves as the social hub of the ship, at least when weather is inclement. When the weather outside is good (or the wildlife is out), the decks are the main gathering point. But let’s face it: You’re off of the ship most of the time anyhow, exploring Alaska’s wilderness. Which is good because there’s no fitness room, spa, or pool. Dining Meals are served in the ships’ main dining room Cuisine is designed with local ingredients and flair, and the seafood is, as you might expect, excellent. This isn’t haute cuisine, but it’s mighty tasty. You can recognize the Alaskan Dream a mile off, thanks to a unique catamaran design that’s rarely seen in Alaskan waters. She’s got some quirky features, but that just makes us like her all the more. Capable of carrying just 40 guests, this 103-foot long ship can do 13 knots flat-out, making her one of the faster ships in the fleet. She plenty of windows to take in Alaska’s scenery but if there’s a drawback to this ship, it’s that open deck space isn’t as plentiful as on some of the line’s other vessels. Cabins All staterooms and suites feature private bathroom facilities, picture window views, and beds that can convert into a queen (though beds in the Owner’s Suite and Vista View Suites cannot be Separated into two twins). While storage space is very decent, cabins are on the plain but pleasant side, with cherrywood furnishings. Category A and AA are very snug. Public areas & activities The Vista View Lounge on Main Deck has 180-degree views overlooking the ship’s bow. It may be the ship’s only public room, but it’s an attractive one, with leather-clad chairs and attractive earth-tone colors throughout. No pool, spa, or fitness facilities. Dining Only one dining room is available aboard the Alaskan Dream, which should come to no surprise to cruisers with small-ship experience. Meals are hearty, local, and plentiful.